In my previous post, I mentioned that Freiburg, Germany, does not allow bicycles to be taken along on trams and buses. Other cities do, such as Toronto – at least outside of rush hours. 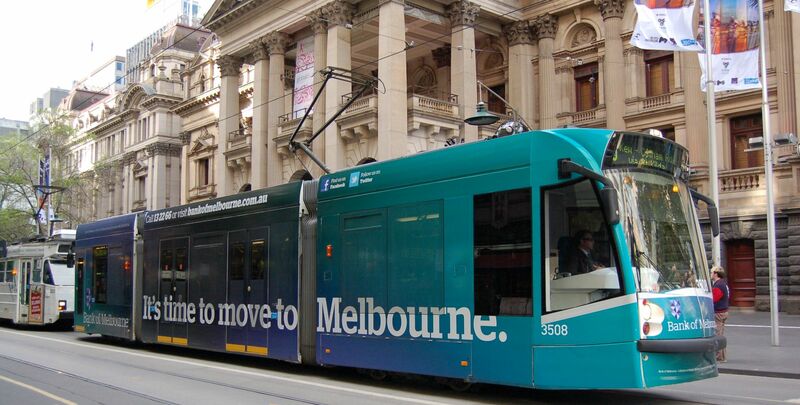 Melbourne, Australia, has a free tram zone in the city center. But a number of cities worldwide offer free transport everywhere, as this list shows. That list doesn’t include any cities in Germany, but there were at least two: Lübben (an hour south of Berlin) and Templin (an hour north of Berlin). Back in the late 1990s, the number of passengers rose eightfold in Templin and fourfold in Lübben when the projects were rolled out (in German). Four years later, the number of passengers had risen 15 fold in Templin (in German). But both towns are quite small (Lübben has a population of 14,000), and the alternative to free transport was closing down the service altogether; ticket prices only covered 20% of the total cost at the time (in German). But in the end, the success itself led to a downfall: the available budget did not suffice to serve growing customer demand. Like Melbourne, Portland and Oregon had free trams and buses from 1975 to 2012 in the downtown area, as did nearby Seattle from 1973 to 2012. So did Pittsburgh. All those programs seem to have worked well enough, albeit on a limited scale; for instance, only 4.4% of all trips taken in Portland in 2011 were done by public transport, while 78% were by car. All these programs were abandoned when the city government couldn’t find funding any longer. A number of the cities listed in the United States seem to be linked to universities, and the service is sometimes quite limited. So are there any examples of really good, free public transport systems? Depending on your viewpoint, Hasselt is a success story or a failure. The town of 70,000 inhabitants succeeded by increasing the number of passengers tenfold in the 15 years after 1997. The program was partly cross-financed with revenue from parking spaces for cars. As people stopped driving cars and parking spaces were drawn down, this revenue decreased – even as more cash was needed for the expanding bus and network. So in 2012, a newly elected local government resolved to cover the gap with ticket prices (in Dutch) of 60 cents per trip. But even at its peak, only 5% of work-home trips were taken by bus for free – compared to 78% in cars. Public transport is only free for residents in this town of nearly half 1 million. Visitors pay 1.60 euros for a ticket. The project has received quite a bit of media coverage, which the town’s website lists. There are indications that people are not switching from cars to public transport; the percentage of trips by car fell by three percentage points. Rather, people who used to walk are now taking the bus or tram: the percentage of pedestrians dropped by five percentage points. The overall impact was immediately felt, but the share of public transport was already very high. In 2012, 55% of trips were made by buses and trams, and that figure rose to 63% in 2013 when free service was rolled out. One reason why this program might keep running over the long-term is its financing model: the city is attracting people to move into town. Each person pays roughly 1,000 euros in income tax to the city, and that revenue covers the transport budget, among other things. We really don’t have an example of a major city using free public transportation to dramatically reduce car usage, which is what German politicians are now discussing. People with cars continue to use them because they are convenient. Expanding the network of buses and trams takes a long time, and cars run pretty well for a decade. Once you have purchased one, you are unlikely to sell it just because public transport becomes free – especially since road congestion improves as a few people switch over. Finally, simply providing a budget based on what is needed today won’t work in the long run if the program is a success and grows significantly. Some way needs to be found so that revenue grows as the number of users increases even without ticket sales. Tallinn may have found a way, but it might not be transferable to German cities, which are already often in the red. What’s needed is therefore probably not free tickets tomorrow, but a long-term commitment of incremental steps addressing specific local issues. A list of cities that have reduced the share of cars significantly might reveal not free public transport, but improvements in the quality of cycling infrastructure and convenience from buses, trams and metros. Nice article, a multi-faceted and long term approach is definitely required. One simple move that SFIK pays for itself is multimodal prepaid RFID transport cards, pioneered years ago in Hong Kong with Octopus. London’s Oyster is but one of many imitators. Is anybody keeping track of the total? Carrboro and Chapel Hill in North Carolina (USA) have operated a free bus system for years. It is made possible by the financial contribution of the University of North Carolina, based in Chapel Hill. As far as I remember, you have to buy an extra ticket for the bicycle. Except for students, where bicycle transportation was included in the (mandatory to buy) semester ticket. I think the bicycle might be the best solution. It is not only clean, it is also good for your health and if you start young the benefits last into old age. I once lived in Amsterdam, on the outskirts. We did a test with friends: we went to the same spot in the city center, one by bike, one by public transport and one by car. Although it was 11 km, the cyclist was there first, then the public transport and only then the person by car. The reason the car was last was only partly because of slow traffic, it was finding a parking and then getting by foot to the spot where we met. And of course the cyclist arrived with the clearest mind, which is great when you go to work or college. Previous PostFree public transportation in Germany?